Make robust, flavorful soups and stocks with this old-time, no-fuss method, still used by gourmet cooks today. Steep herbs and spices for stews, soups and sauces. Each bag is 3-3/4" x 3"
Note: For boiling and steaming only; not for use in oven. 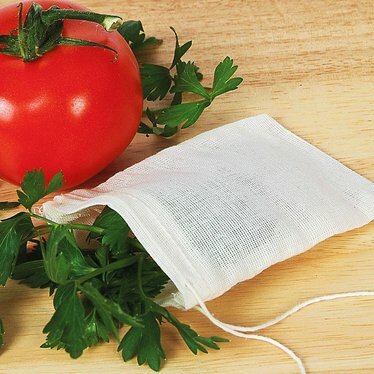 Muslin Spice Bags Make robust, flavorful soups and stocks with this old-time, no-fuss method, still used by gourmet cooks today. Steep herbs and spices for stews, soups and sauces. They are working great to hold spices in multiple dishes and clean up well. I love these spice bags when I make Kombucha. I can easily add loose leaf tea into my blend. Once completed, I empty the bag, rinse and re-use. The bags are sturdy and perfect for loose leaf tea. These small bags are well made and suitable not just for spices, but can be used to hold small amounts of rice as a desiccant in cannisters of items that tend to absorb moisture from the air, such as baking soda, washing soda, and Borax. I sew and could make something similar, but they're so small I think they'd be nerve-wrackingly tedious, so they are well worth the price, IMO.